How do you spend the hot summer day?Stay in house with your air conditioner? It is not a better idea.This mist cooling system can cool your garden effectively. It allows you to enjoy your outdoor activities without having to worry about being too hot under the scorching sun.Children can play outdoors more easily and happily. Your pet can also be more comfortable this summer. Mist will reduce the temperature around plants and bring enough water to them. Plants will be taken really good care of by this mist cooling system for green house. This Kit has Everything you need to get started with Drip Irrigation and Stop Watering by Hand - With only three simple steps you can set up the system with ease and simplicity. Superior Quality - Professional quality hose is made from linear, low-density polyethylene. UV inhibitors have been added to resist the effects of the elements. It can be left out year-round, buried or on the surface, in any weather. Quality is designed into products at every stage of the development process and is ensured by detailed inspections throughout the production cycle. Dedicated Customer Support - The friendly and knowledgeable worker support staff is trained in all aspects of drip irrigation and are available to help should you ever require assistance. 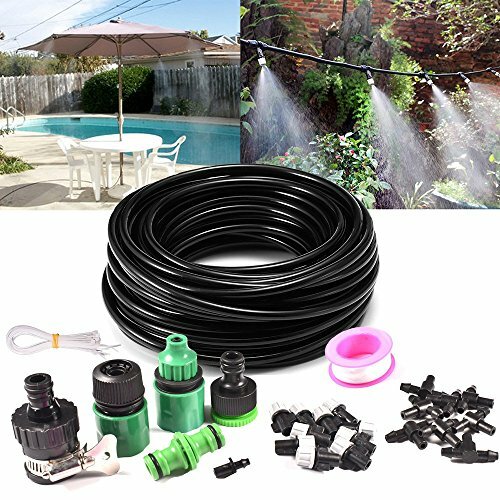 【Product Included】: ( US standard ) 10m 4/7'' PE Hose, GARDEN HOSE ADAPTER, 1/4'' Quick Connector, 1/2" & 3/4" Threaded Faucet Connector, Universal Faucet Connector, Double Head Adapter, 10 x Plastic Mister Nozzle (tee), Plastic Mister Nozzle (end) ,Teflon Tape, 10 x Cable Ties, user manual. If you have any questions about this product by GPSGO, contact us by completing and submitting the form below. If you are looking for a specif part number, please include it with your message.